Can Josh Hawley Be The Missouri Hero That Finally Defeats Google's Empire Of Evil? 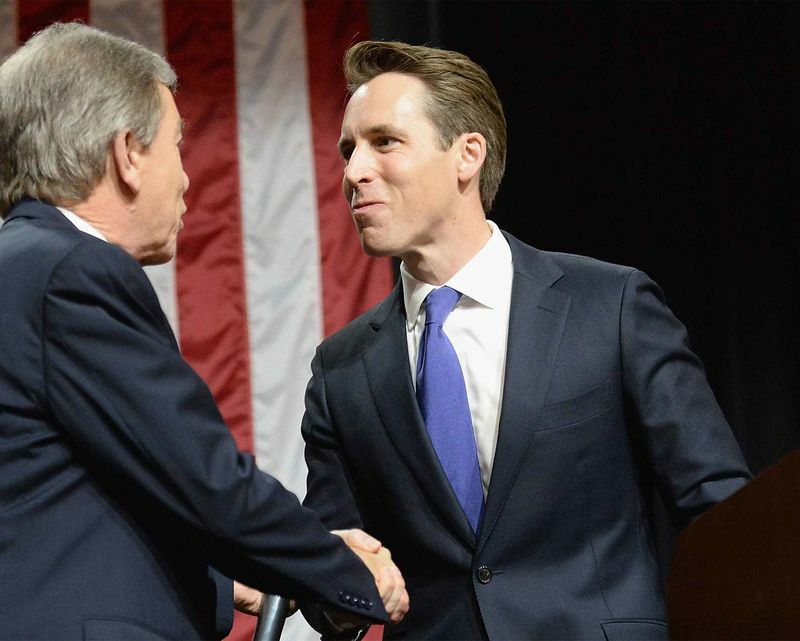 Senator Roy Blunt greets newly elected Missouri Attorney General Josh Hawley on Nov. 9, 2016. Hawley, a 38-year-old Yale Law School graduate with Ken doll looks and Federalist Society bona fides, has spent his 14 months in office pursuing cases that seem designed to attract attention beyond Missouri’s borders. Alphabet Inc., Google’s parent, is his biggest target yet. The company owes its market value of more than $750 billion to its overwhelming share of global internet searches—more than 90 percent, according to analyst Statcounter. In November, Hawley subpoenaed Alphabet as part of an investigation into its possible violations of Missouri antitrust and consumer protection law. As a legal matter, bringing a case against Google will be difficult, but the company is more vulnerable than it’s been since 2011, when the U.S. Federal Trade Commission started looking for evidence of its anticompetitive business practices. Although Google managed to avoid charges then, the European Union fined it a record $2.7 billion last June for violating EU antitrust laws. Google has appealed the judgment. Hawley may have other motivations to take up a similar crusade in the U.S. On Feb. 27 the Missouri attorney general formally launched a campaign for the U.S. Senate. He’s running as the favorite to win the Republican nomination in what is arguably the most important race in the 2018 midterm elections. If he can unseat Claire McCaskill, a two-termer who is one of the most vulnerable Democratic senators up for reelection, Republicans will likely maintain control of the Senate. In that case, Hawley would have a prominent platform to criticize Silicon Valley at a moment when the public has become much more skeptical of Big Tech. “We need to have a conversation in Missouri, and as a country, about the concentration of economic power,” he says. Lawyers on Hawley’s staff are still considering the evidence, and he says he’ll make a decision on whether to bring charges this summer—when his Senate campaign will be in full swing. A person familiar with the case says several other states are considering similar investigations. This would strengthen Hawley’s critique of Google and ensure that it remains in the national press. Google, which says it’s cooperating with Hawley’s investigation, dismisses it as an attempt to revive a long-discredited attack. “We have strong privacy protections in place for our users, and we continue to operate in a highly competitive environment,” spokesman Patrick Lenihan said in a statement. The atmosphere is more ominous for Silicon Valley than at any time in recent memory. Big Tech scares people who worry about privacy, robots taking their jobs, and the mental development of their smartphone-toting children. Liberals have criticized tech companies for being insufficiently vigilant in combating hoaxes and online harassment. When platforms such as YouTube, Facebook, and Twitter have attempted to respond, Republicans have complained about a clampdown on conservative speech by liberal-leaning companies based in California. Last year, Ajit Pai, head of the Federal Communications Commission, cited the censorious nature of tech companies as a reason to revoke net neutrality. Like Microsoft in its heyday, Google runs an utterly dominant tech service while also developing products to compete directly with companies that rely on it. Starting in the mid-2000s, Google began deemphasizing “organic” search results (lists of links to web pages ranked by perceived relevance) and instead started offering the information users often wanted on the search page itself (restaurant reviews, famous people’s heights, the population of Akron). That meant less web traffic for some competitors. The practice attracted the FTC’s attention in the early years of the Obama administration, but instead of bringing a lawsuit, the commission reached a settlement with Google in 2012 allowing websites to opt out of having their material presented directly on Google’s pages. In 2015, however, the FTC inadvertently revealed that it had considered taking a more aggressive stance. A commission official accidentally sent Wall Street Journal reporters sections of an internal report claiming that Google appropriated content from competitors to improve its own search rankings and had threatened to punish anyone who complained. According to the internal FTC report, Google put restrictions on companies that sought to work with competing search engines and prevented advertisers from using Google data to improve their ad campaigns elsewhere. Taken together, the allegations illustrated how a company with a search monopoly could throw its weight around in other areas. The leaked report recommended a lawsuit, but the FTC’s commissioners decided not to pursue one. (The commission later said Google had addressed the practices in question.) The EU verdict and a more recent one in which Indian authorities fined Google $21 million for anticompetitive behavior show that wasn’t the last word. A similar interpretation has become popular in certain left-wing circles, part of a movement critics refer to as “hipster antitrust.” At times, Hawley’s arguments on the matter echo liberal groups like the Open Markets Institute, which views market concentration as harmful in and of itself. Google’s defenders say a focus on market competitiveness unduly privileges weaker companies that should be left to fail and that some of the biggest advocates for antitrust litigation against Google are other tech giants. In February, Politico reported that FairSearch, ostensibly a consumer protection organization, is controlled by Oracle Corp. and South African media conglomerate Naspers Ltd. Hawley’s inquiry hews closely to long-running complaints from local listings site Yelp Inc., which has lobbied states to bring antitrust cases against Google. And one of Hawley’s biggest campaign donors has been Peter Thiel, the venture capitalist and conservative bomb-thrower who’s criticized Google’s concentrated power. Hawley denies carrying water for Google’s enemies, and some antitrust experts say his theory is credible. “It’s a solid case, and I’m glad someone’s pursuing it,” says Chris Sagers, a law professor at Cleveland State University. BOTTOM LINE - The Missouri attorney general is investigating Google at a relatively vulnerable time for it. Things will get worse for the company if he becomes a U.S. senator or if other states sign on.